Museum to the South African Forces, Delville Wood. 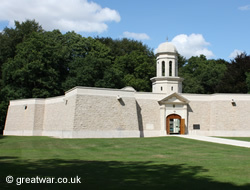 The museum at Delville Wood was constructed following the laying of the first foundation stone on 7 June 1984. Just under two years later, on 11 November 1986 it was unveiled at a ceremony by the State President of the Republic of South Africa, Mr P W Botha D.M.S. The museum is built around the centrepiece of the Cross of Consecration. The Cross is located in a courtyard which can be seen through magnificent floor-to-ceiling glass windows etched with battle honours and symbolic images. The museum is dedicated to the memory of the 25,000 South Africans, men and women of all creeds and races, who volunteered to serve their country in times of war during the First and Second World Wars and in Korea. The museum was designed to be a replica of the star-shaped stone fort with five bastions called the Castle of Good Hope in Cape Town. The original castle was built between 1666 to 1679 by the Dutch East India Company, known by it's Dutch name of Vereenigde Oost-Indische Compagnie (V.O.C.). The moated castle was built as a replenishment station for the Company on its seafaring spice trade-route between the Netherlands and the Dutch East Indies (now Indonesia). 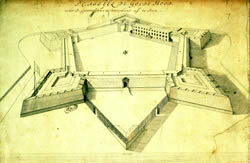 Built on the site of the wooden Fort de Goede Hoop the construction of the star-shaped stone castle was paid for by the Dutch East India Company (V.O.C.). The buildings, their contents and the inhabitants were defended by a garrison of soldiers. There was a church, living accommodation, workshops and prison cells. It became the administrative and military centre in the Cape for the area settled by the Dutch colonists. The Castle of Good Hope is the oldest suriving colonial building in South Africa. It has been preserved as a public building and it's heritage is now formally protected as a visitor attraction and museum. See our Related Link below for a link to the castle in South Africa. 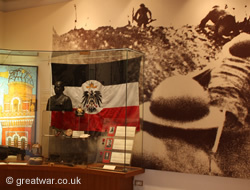 First World War displays in the South African Forces Museum. Having entered the museum visitors immediately see the Cross of Consecration in the central courtyard through the magnificent large etched glass windows. Display cases in each section contain a wide variety of artefacts, documents, letters and diaries. There are framed works of art and stunning bronze friezes by Danie d Jager on the walls. Photographic panels and maps illustrate the South Africans and where they were in action. Many of the items have been donated by private individuals, some being relatives of soldiers who fought in Delville Wood in July 1916. Some items have been found in the wood. The Cross of Consecration as the centrepiece of the South African Forces Museum. The Cross of Consecration is located in the open, central courtyard of the star-shaped building. The Cross can be seen from all sides through the floor-to-ceiling glass windows as visitors make their way around the museum. Car park for the South Africa (Delville Wood) National Memorial and Museum. 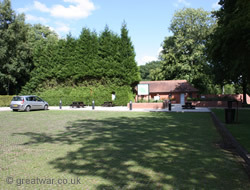 Visitors are advised that the Information Centre and toilets at the car park for the museum and memorial were closed in 2010 and they may not be re-opened at the time of your visit. If they are available to visitors, please be advised also that the normal closure opening hours are daily 10.00 to 18.00 hours, closed on Mondays. Benches at the car park. Visitors to the Delville Wood Memorial and South African Forces Museum are required to park and walk into the wood. 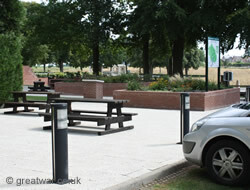 There is a large, free designated car park within a few minutes' walk of the memorial and museum. 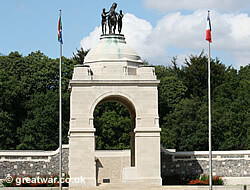 The South Africa (Delville Wood) National Memorial and South African Forces Museum are located in the centre of Delville Wood (Bois Delville). The wood is on the east side of Longueval village and is signposted from the centre of Longueval. 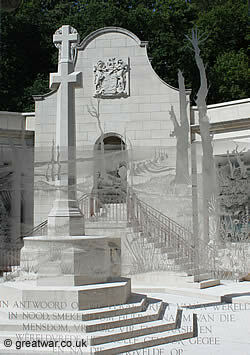 South Africa (Delville Wood) National Memorial. 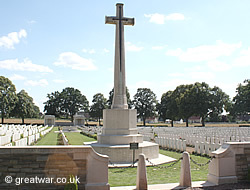 The third largest British & Commonwealth cemetery on the Somme battlefields is located close to the South Africa (Delville Wood) National Memorial and South African Forces Museum. There are 160 South African burials in the cemetery, 95 of whom are identified.